Berlin (AFP) - German Chancellor Angela Merkel stood firm Monday on her refugee policy, despite a drubbing in regional elections described as a "debacle" in which disgruntled voters turned to the anti-migrant AfD. Merkel's Christian Democratic Union (CDU) was at the receiving end of voter anger, suffering defeats in two out of three states in Sunday's elections -- including in traditional stronghold Baden-Wuerttemberg. The stinging result for the conservative CDU was accompanied by a surge in backing for the right-wing populist Alternative for Germany (AfD), which had sparked outrage by suggesting police may have to shoot at migrants to stop them entering the country. AfD's double-digit score in all three states indicates that the public outrage fuelling far-right movements such as France's National Front and Austria's Freedom Party has also gained a firm foothold in Germany. Sunday's elections were the biggest since Germany registered a record influx of asylum seekers that reached 1.1 million in 2015, and the vote was largely regarded as a referendum on Merkel's decision to open the doors to people fleeing war. The mass-circulation Bild newspaper described it as a "day of horror" for Merkel, as calls multiplied for her to change tack. 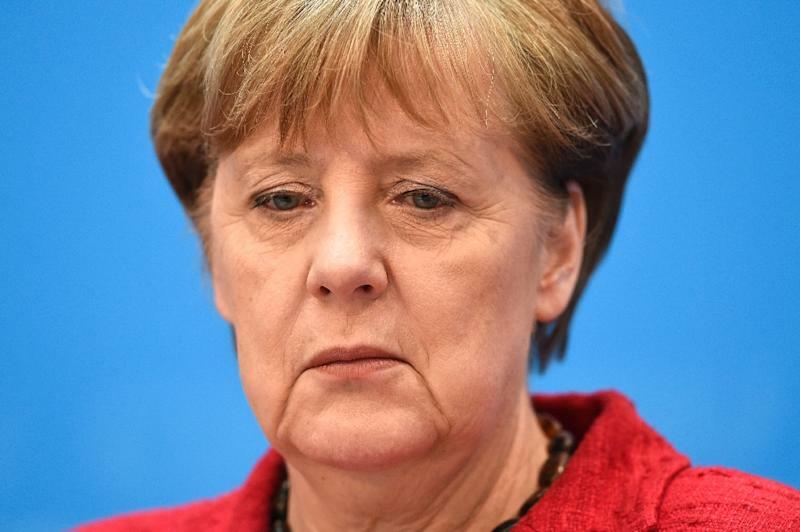 While acknowledging that some had cast "protest votes", the German leader refused to change her position. "I think that the approach is correct," she told journalists, reiterating her strategy of a common European policy to bolster the security of the EU's external borders and cooperate with Turkey to stem refugee flows. Even though she admitted that Balkan states had done Germany a favour by closing their borders to migrants -- a move that led to a significant drop in new arrivals -- Merkel insisted just days ahead of an EU summit that "we can see from pictures out of Greece that that is not a sustainable solution". Merkel is increasingly isolated on the European stage as she has refused to impose a cap on arrivals, a decision that is irritating her neighbours who say it encourages migrants to keep coming. 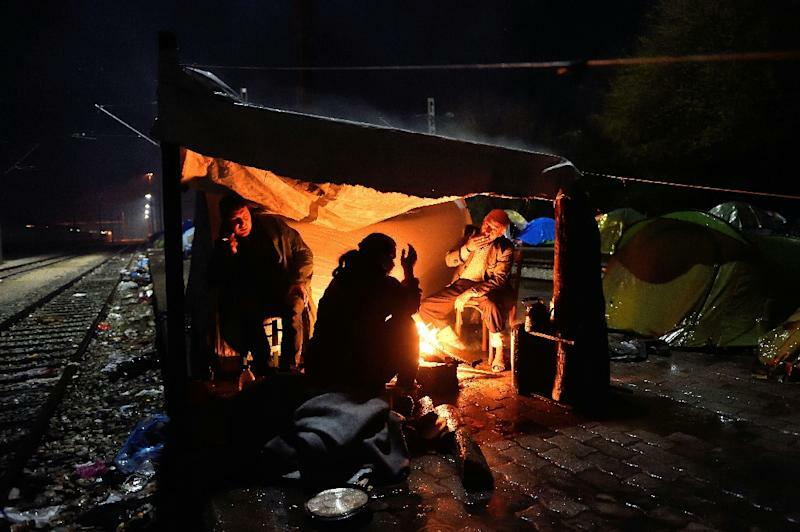 Ahead of Thursday's summit in Brussels, when leaders are due to finalise a deal with Turkey on stemming the migrant influx, Austrian Chancellor Werner Faymann said Merkel must stress that Germany is no longer willing to take in an unlimited number of refugees. "We need clarity. Everyone must know that it is a false hope to think that Germany would simply wave people in," he told Die Welt daily. Merkel's strident critics in the CDU's Bavarian sister party, the CSU, also piled on the pressure after the regional polls, which serve as a key test ahead of general elections in 2017. The main reason for the poor CDU showing "is the refugee policy. It makes no sense at all," CSU chief Horst Seehofer said at a party meeting on Monday. Demanding changes, Seehofer said: "It can't be that after such an election result, the answer to the electorate is: everything will go on as before." In the aftermath of the vote described as "Black Sunday for the CDU" by news website Spiegel Online, Merkel also came in for criticism for unwittingly allowing the AfD to flourish. For most of the past decade, Merkel enjoyed stellar popularity ratings as she pushed middle-ground policies which helped her party capture voters from the centre-left Social Democratic Party (SPD). But critics say it has left her conservatives' right flank exposed. In Sunday's vote, the AfD gained as many as one in four votes in the eastern state of Saxony-Anhalt, emerging as the second biggest party there. AfD leader Frauke Petry called it a "good day for democracy" while Austria's Freedom Party hailed the German party's success as a win against the "EU juggernaut". 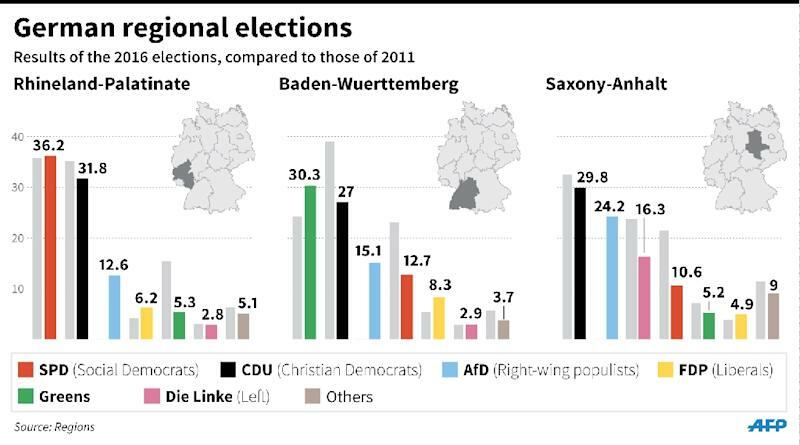 Nevertheless, the irony is that Sunday's polls showed there is no obvious successor to Merkel, as the CDU's biggest mainstream challenger and junior coalition partner -- the SPD -- emerged weakened in two out of three states where it came in behind AfD. And Julia Kloeckner, touted previously as a possible CDU successor to Merkel, failed to lift the party to a win in Rhineland-Palatinate with a campaign that challenged Berlin's line on asylum. Even Seehofer acknowledged that Merkel was still the right chancellor, while the Frankfurter Allgemeine Zeitung questioned who had the clout to force her to reverse her stance on refugees. "The party has less choice than ever" for its succession, it noted.